While doing some housekeeping, I came across some old Fluffy Gardens development work. Fluffy Gardens had a somewhat unconventional visual beginning and was then refined in several stages until it was ready for screen. I have put this design process together in some collected images in my GALLERY, including a few explored yet unproduced ideas that have never been seen before outside of the Geronimo Productions (then Monster Animation) studio. I do hope you find it interesting! At least, not at first. The first thing to focus on is just getting basic movement looking as if it came straight from the most controlled scenes of the first series. Walking, picking stuff up, showing different expressions and that sort of thing. They are surprisingly easy to get wrong. So don’t go in attempting anything fancy. Keep everything grounded and just try to get it all working. Add little touches. Try something unexpected. It may not always work. That’s okay. But look at some of the more special scenes in series 1. You’ll see they’re always simple and never go crazy (well, except for Poppy the Tiger’s dream sequence) but, every now and again, there is an extra touch in the animation. A hidden smile from George the Mean Yellow Dog, a close hug, wet fur, that sort of thing. Do be careful and certainly go sparingly. But when it’s right for a scene, have a think about what extra you could do. Add something special. Surprise me! So there it is. First, know your field and know what you’re doing. Then get creative and deliver something special, something exceptional, something unexpected. That’s where the magic lies. This is my last week at Geronimo Productions. A chapter ends and a new adventure begins. I can’t help but think back to what we have achieved over the years, how much has changed and of all the little moments that defined not just the studio but who we have become. It was the end of my second year in animation college. Sullivan Bluth had just closed down. But there were new studios popping up. I gathered my portfolio and turned up to one of these – Monster Productions. I met a young, pleasant yet intimidating producer (I was young – everyone was intimidating to me), Gerard O’Rourke. He was running the show and one would expect him to know what he was doing except he had this crazy idea about starting me off as an animator. Did he not realise I was still in college? How new I was? Well it was a struggle, I’ll admit. But I got better. I had to. Cut to many years later and I am working side by side with Gerard as a children’s content specialist, forming and moulding shows with an impressive catalogue behind us. Maybe he knew. Perhaps that is why he gave this nervous young student a chance? Was he thinking, I’m going to give this kid a shot because one day we’ll build a studio and we’re going to make great things together? Could he possibly have known how long we would be linked and what we would achieve? No. He couldn’t have known. He didn’t have to know. What Gerard did on that day was create the potential for all that to happen. He took a chance on a person and suddenly that path came into being. It led to great things. Over the years, I have seen Gerard give so many people their start and, each time, he creates a potential future. It doesn’t always lead to anything. That potential is not always realised but the opportunity is there and, so often, interesting and unexpected things are the result of those chances taken. When we take a chance on a person or even take a chance on an idea, we create a new potential future. It is like planting seeds that, one day, could grow to be something wonderful. We can’t know the results and it would be wrong to constantly look for them, but we can create the potential. And so we should. This is just one of the many things I have picked up from Gerard as we built what would become Geronimo Productions and I will always be grateful for the opportunities. I have a long list of personal achievements filed under the heading “if it wasn’t for Gerard…” and, at this stage, I am hoping he has a similar file with my name on it. Gerard and I will, no doubt, work together on many projects in the future and will always be linked by our strong catalogue of shows. At the end of this week, one phase ends and a new phase begins. What am I doing? I am taking a chance on an idea. New aims, new missions. Interesting things are coming. And in the meantime, I am always here to talk projects, content, scripting, preschool and more so do feel free to get in touch. I have been Creative Director of Geronimo Productions (formerly Monster Animation) for well over ten years. 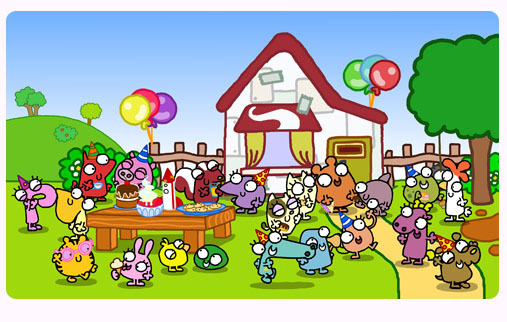 During that time, we took Monster from being a small studio making commercials to being a studio with a mission, with a drive that reflects my need for the highest-quality children’s programming and an impressive catalogue of shows – Roobarb & Custard Too, Fluffy Gardens, Ballybraddan, Punky, Planet Cosmo and more. Along with producer, Gerard O’Rourke – who I have worked with for eighteen great years – I am incredibly proud of what we have achieved with this studio, what we have built and all the content we have created and produced. And now I announce my resignation as Creative Director of the company. Why? Well, the short answer is simply that it is time. It is time to explore other avenues. Time to build and manage new content within new frameworks. Time to open myself up to different collaborations. Time to make a new leap. With Geronimo Productions, I have achieved what I set out to achieve all those years ago. It is now a studio that is very different to the one I took on when I stepped into the role of Creative Director. One with tried and tested methods, a strong catalogue with so many success stories and new shows that I have no doubt will become the next success stories. The studio has its own momentum and drive and will flourish. And for me, on top of the business of building a studio with Gerard, creating and refining production methods, guiding the creative vision and choosing and managing projects, I have seen more than five shows – over 23 hours of television – shaped, pitched, produced and sold. My own Fluffy Gardens went to over 100 countries and Planet Cosmo is now building its own sales with a wonderful reaction from the industry and, more importantly, from children and parents. I have been and will continue to be a champion for positive preschool entertainment across all areas from creation to screen and beyond. And so it is time. I will be with Geronimo Productions for the next month, making sure that the current Geronimo projects are all in good hands and will support them and lend my expertise after I leave. Geronimo Productions will continue to deliver great shows for children and I wish them every success in the future. Thanks to Gerard and all Monsters and Geronimites past and present for being with me on this journey. We did it. 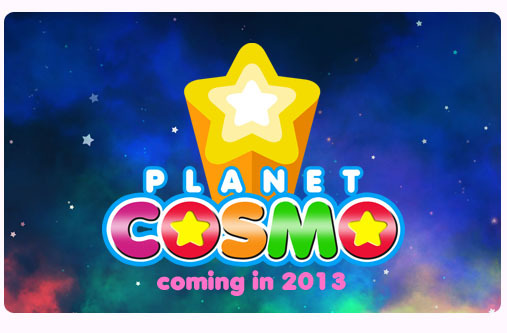 Last week the final tapes for Planet Cosmo left the building, the completed series. Mission complete. Wow, what a journey. It began early 2010 with just a wish and a doodle. That’s one of the very first images of Cosmo below, drawn with my finger on an iPod Touch using the old Brushes app. I didn’t know back then that it would be a cartoon show. But I had more than just that doodle – I had an aim. A mission. 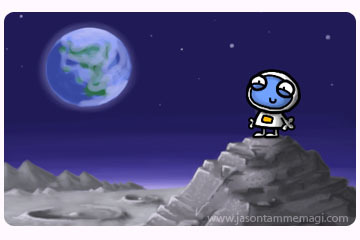 I wanted to introduce the planets to children. Whole other worlds, real worlds, some of which can be seen by children just looking up at the sky at night. How amazing is that? First, however, I had to entertain. I had to give children reasons to watch the show regardless of any prior interest in space. This would be a show for any and every child, boys and girls alike. And so slowly ideas became concepts, then characters, methods, structures and stories. Eventually, I knew I had it ‘ a show that delivered what I felt children both wanted and needed (not always the same thing!). Curiosity. I love to spark questions. And finally, the core of the show’s direct educational goal ‘ focused facts about our Solar System. Real amazing things that kids can share. If kids aren’t interested in that? No problem, the show has fun, humour, songs and adventure! It exists as entertainment and can sit on any preschool schedule, even without an educational remit. But soon, children may find themselves asking more questions, realising that beyond the fictional stories there are real planets out there (and we directly state what’s real in each episode). They may find that interest in space grows. And the more we feed that interest, the more likely it is that it will continue to grow. Wouldn’t that be something? I knew production would be hard work. We were aiming high and our resources were limited. That just means you either find places to cut corners or everyone pushes that bit harder. Guess which one I went for? Yes, we pushed. We pushed hard. Two things happened: Firstly, we had some problems early on. Secondly, the quality was pushed even higher (mainly due to some of our excellent animators exceeding our expectations ‘ you guys rock!). So now we were dealing with even higher standards and were playing catch-up as we dealt with our early production difficulties. There were times our deadlines seemed impossible. Everyone on the show stepped up and put in their all. Some found their limit and the cracks began to appear. Others could have kept on going, showing a level of support I will always appreciate and never forget. Amazing on such a tough production to have people who are an absolute joy to work with. I am not going to name everyone because otherwise this would be a ridiculously long post but I want to mention some of those people with us in those hard, last days of production ‘ Ciaran Lucas on backgrounds who did fantastic work and worked harder than just about anyone I have ever seen on any production, L√©an Duffy who jumped into compositing like Han Solo returning to save Luke at the end of Star Wars, Roxy Lyon who worked long hours as she dealt with task after task ending up on her desk, Dale Robinson who stepped in just when we needed him even though he had so much else going on and Graham Scott for brightening up the studio and keeping us all going. And a very special mention for Simon Crane. Simon and I have worked together for years. He’s a good friend and an exceptionally talented animator and director in his own right (Simon is directing Geronimo Productions’ Punky) and he was my directing animator on Planet Cosmo. Simon’s level of enthusiasm and support kept me going, gave me energy when I needed it. This show probably just wouldn’t have happened without him. Thank you, Simon. Everyone did great work. 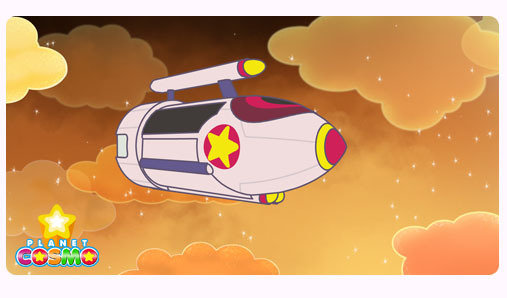 You should check out the credits when Planet Cosmo launches because one of the things I am most proud of is that we were able to make this show with so few people. You’ll find a tiny crew list at the end of our show. No hidden credits, no outside studio. That was it. Just us right here in Dublin. And you’ll even find quite a few names repeated in different jobs ‘ multitasking was an essential on this show! And even with such a small crew, the show is exactly what we wanted. I could never, ever use our lack of resources as an excuse for anything on this show. Planet Cosmo is actually a better show than the one I set out to make. There are two other people I will mention here though. One is my script editor, Hilary Baverstock. These episodes only worked because the scripts were right to begin with. Without good scripts, we would have been working hard to make a show that looks pretty and does little else. So, as script editor, Hilary’s influence was felt throughout the entire production. And the other person is the producer of Geronimo Productions, Gerard O’Rourke. Gerard showed faith in this project from the second I showed it to him and he pulled the financing together to make it happen. The importance of that part is obvious but the immense work that goes into it is often never seen by those either making or watching the show. And Gerard now takes on phase three of what it is to make a show ‘ going out there to sell it. Find him at Kidscreen in New York and ask him to show you some full episodes! So there you have it. We have completed Planet Cosmo. Fifteen episodes of animated fun and adventure, bringing the planets to children. The show launches on RTE2 in Ireland on the 18th of February and international broadcasts will follow. Find the show on Twitter at @PlanetCosmoTV for clips and images. I hope you all love the show. Finally done. We made it. As many of you will have seen, it was announced last week that Monster Animation & Design has changed its name to Geronimo Productions. Monster Animation, started by owner and producer Gerard O’Rourke, has been going for 17 years and I joined very early in its history, taking the position of Creative Director of the company more than ten years ago. From there, we took Monster Animation from advertising into broadcast television, starting with us producing Roobarb & Custard Too and then creating Fluffy Gardens and moving us through Ballybraddan, Punky and now our new show and my latest creation, Planet Cosmo. All the while, I have been overseeing the creative vision of the company, building the studio methods and systems and creating, moulding, nurturing and producing shows. We have come a long way together. The name change is something Gerard and I have discussed for many years (mostly because of international confusion with another Irish Monster) and, with a brand new show launching, the time finally seemed right to make the switch. So this week, we’re working hard as Geronimo Productions to finish Planet Cosmo and you’ll be hearing a lot about that very soon. The studio at Geronimo is gearing up for more Punky (I’m serving as script editor at the moment with Andrew Brenner writing) and everything is moving forward with a new name and a new identity. Will it bring exciting things? I think it will. It’s going to be a big and rather interesting year for all of us. 2013 is going to be an exciting year for me. Many of us at Monster Animation have been working hard over this little holiday season to get the last few episodes of our new show finished and 2013 is the year it gets released to the world. 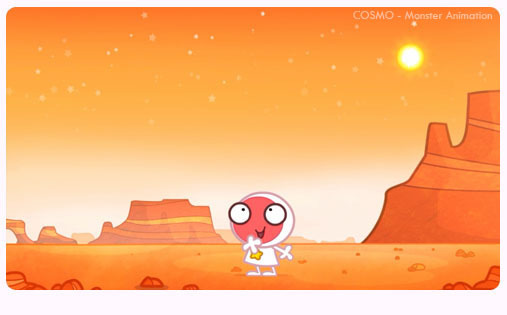 For me, Planet Cosmo is more than a new cartoon show. This is the culmination of everything I have worked on and worked for since I began making children’s shows. It is the result of years of practical experience, years of research and so many intentions, goals and dreams. 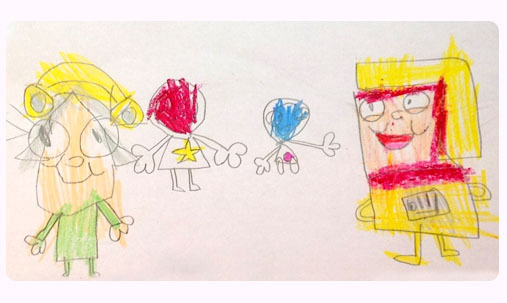 A preschool show full of laughs, smiles, songs and fun that introduces children, boys and girls, to whole other worlds, each one amazing in its own way. And not just fantasy ‘ these worlds are real. A show to entertain and inform. And hopefully inspire. All in just fifteen episodes. That’s almost three and a half hours, a Peter Jackson feature, so not that insubstantial. I always count myself lucky that I get to form a show from nothing, a blank page, and take it all the way to the finished picture across every part of the process. Yes, it’s a heavy work load but it comes with so many advantages. A unified vision for one thing but also each step always has the other steps in mind. I don’t write without picturing how we in the studio actually make it happen on screen, for example. I don’t think a show of this type could be made on the budget we have without that. Our resources were tight and we aimed high. Thanks to the amazing people we have working on the show right now, we reached even higher. So, yes, I’m excited about letting Planet Cosmo out into the world in 2013 and, once we finish the show, I will be putting my faith in Monster Animation’s producer, Gerard O’Rourke, who should be shouting about about it from the rooftops, getting it to the right broadcasters and having it seen by as many young children as possible. Because I know from our testing already that children are going to love this animated series and it’s really good for them. So if you see him, or indeed me, at an event, ask to see some Planet Cosmo. And if you’re a parent, keep an eye out for it. So what of the rest of the year? Well, we at Monster will be making series 2 of Punky, written by Andrew Brenner and directed by my very good friend and colleague, Simon Crane. I have an awesome little collaboration between a fantastic electro artist and my daughter, Daisy, to work on (more on that when Cosmo is finished). And I will of course be busy working to create the best, most fun and good children’s content that can possibly be made. And, on my little blog here, I will continue to write every Monday. So if you have any questions or topics you would like me to cover, feel free to let me know. I hope that 2013 brings you exciting things, progress, fun, new projects, and all things good for children everywhere. Have a fantastic year and, as always, thank you for stopping by my little corner of the web. Last week as the Curiosity Rover landed successfully on the surface on Mars, at Monster Animation we were battling the odds hoping to achieve our own Martian victory – to finish our very first episode of Planet Cosmo, in which Cosmo and her Dad climb the mighty Olympus Mons on Mars. Being honest, getting that episode together often felt like climbing a mountain and there were times it felt like we would never get there. So often we looked up but the peak was out of sight. And so we carried on. We didn’t just conquer that one episode. We finished two, adding an episode in which Cosmo finds herself on the surface of Mercury. Two episodes. What we have now is no longer just a collection of elements – animation, backgrounds, voice recordings, songs, effects. We have a show. A real show. Sure, we still have thirteen more episodes to make and there will be small things to improve even in these finished episodes (production of a show almost always reveals improvements that aren’t found in the first episode completed, it’s what I call First Episode Syndrome) but it is so important to acknowledge the victories, especially ones as important as this. It is vital to take time to really appreciate the successes, no matter what needs to be done next. Those successes show us just what we can achieve when we push ourselves further. Holding on to the victories can keep us going when production gets tough. And this one has been tough. The victories show us why we did it in the first place. Seeing the episodes finally come together and being able to watch them from start to finish, as they’ll be aired, leaves no doubt that this is all worth it. The Planet Cosmo team is doing an amazing job and should be very proud. And now as they work away on those individual elements, they’ll have an even greater understanding of where their pieces fit and the importance of each part of the process. For me, I wanted to deliver a fun show for children that introduces them to the planets and I can see we’re doing just that. A victory. Every production has its own victories, big or small. Be sure to acknowledge and enjoy them. By the way, if you’re at the MIP TV market, a Planet Cosmo episode pr two should be available to view there so check them out. If you’re not attending, it will be a while later before they make it out into the world but I can’t wait to show all of you. I’m taking a break for a couple of weeks so just a minimal update next week (assuming the schedule posts thing works). Hope you all have a fun and productive couple of weeks, full of victories.